How important is the mouthpiece? 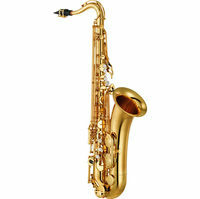 The saxophone is a popular member of the woodwind family even though it is made of brass. They are transposing instruments ranging from the soprillo, the highest, down to the lowest; a sub-contra bass. Most commonly used are the soprano and tenor, pitched in ‘Bb’, also the alto and baritone, pitched in ‘Eb’. Learning a musical Instrument at a young age has a whole host of benefits but it is important that children are comfortable holding and playing their saxophone before they start their musical journey in earnest. Alto saxes are one of the most requested instruments we sell but because of their weight and size we recommend that the student should be 9/10 years old before learning on them. The other key challenge that many younger woodwind & brass players will face is considering how the shape of their mouth and teeth will change over time and how this will affect their embouchure. Embouchures are very personal to each different players and require many hours of practice and development for improvement. The change in mouth shape and teeth can make it difficult for players to form a consistent baseline from which to develop their playing. In recent years there has been an increase in the number of very young players taking up Soprano Saxophone, usually the more traditionally shaped curved version. This can sometimes be a little problematic as the size of the mouthpiece and design of the Soprano can mean the instrument may be difficult to control. It is worth checking with the tutor that they are happy teaching young players on the soprano sax. Another alternative would be an instrument with reduced keywork. The Trevor James Alpha Sax is the same size as the alto but has some of the extra chromatic keywork removed to make the instrument lighter. 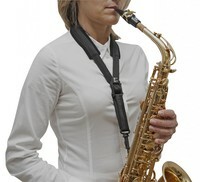 To help with the weight of the sax a harness can also be used to help take the weight off of the player’s neck and distribute it over the shoulders. This can help prevent the player straining their neck and encourage better posture. A vital part of your saxophone, mouthpieces are available in a large range of different sizes, dimensions and materials. 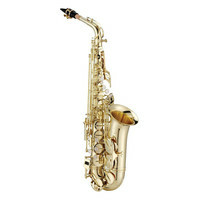 Student saxes are usually supplied with a functional yet basic mouthpiece with ligature and mouthpiece cap. These tend to be manufactured from plastic and cast from a mould whereas more expensive, higher standard mouthpieces will tend to be milled from ebonite, a hard rubber based material, or made from metal. Once players reach a certain standard it is common that they will look to update their mouthpiece and/or ligature to better match their embouchure, chosen repertoire and style. More expensive mouthpieces benefit from improved design, precision and manufacturing quality. Many see mouthpiece design as more of an art than a science. It is an area of much debate between woodwind players. Much like the mouthpiece, your ligature has a big effect on the sound that you produce. It does this by firmly holding your reed in place against your mouthpiece. Like mouthpieces, ligatures are available in a wide range of materials, designs and finishes. Most student models will be supplied with a basic, likely metal ligature which players may look to upgrade once they are past the early grades. More expensive ligatures may use more innovative fastening systems reducing the dampening effect that cheaper ligatures may suffer from. An often overlooked component, your crook provides the joining piece between mouthpiece and body. Although pro-level players may look to upgrade their crook, it is unusual for students to feel the need to do this. Crooks can be made of brass and bronze and finished with different coloured lacquers and platings.. Your Saxes body is made of three constituent parts, the main body, bow and bell. These three parts of your sax are most commonly made from brass but are occasionally made from other materials such as bronze or silver. This brass is then coated in a layer of lacquer (in various colours) or plated, for example in silver, gold or black nickel, or left bare in a RAW (unlacquered) finish. These different finishes can affect the sound the sax makes so it is worth trying them out. The method of construction will change from single post to a more robust ribbed construction. This often makes the sax feel heavier. The bore of your instrument describes the cylindrical hole down the middle of your sax through which air travels creating sound. For most student models the bore is smaller to enable sound to be produced more easily and responsively. In more expensive, pro level models you may start to see wider bores which open up the sound. Different bores offer different qualities for example the Yamaha YAS875 has a bore suited to classical playing and the YAS82Z more suited to Jazz. Again the best way to work out which is the right one for you is to try them. Lastly, it is important to use a pull-though after each playing session to remove any moisture that remains in your saxes bore to keep your pads in good condition and increase their life span. The keywork on a student sax tends to be cast whereas on pro instruments the keys are cut out of a sheet of brass and forged together. This creates a sturdier key but is much more time consuming contributing to the higher price tag. Some models will feature silverplated keywork which should be bright and hard wearing. A silver polishing cloth can be used to keep silver plating in good condition. Natural oils from players’ fingers will erode and tarnish keywork over time so regular cleaning will help to increase the life span of the instrument. The movement from plastic to mother of pearl touchpieces can also be seen on more expensive saxes. Not the most exciting accessory in the world but still very useful! Polishing clothes when used frequently, will keep your saxophone's body and keywork in gleaming condition, free from fingerprints. More than just improving aesthetics, keeping keywork clean will extend the lifespan of your instrument as it reduces erosion that can be caused from the natural oils in players’ hands. A good quality pull-through suitable for your saxophone is invaluable in keeping it in good working order. These are available in a range of different materials including microfiber cloth, leather and chamois. Using a pull-though after each practice or performance removes moisture from the bore of your instrument. This reduces the chance of mould and bacteria growing. Another accessory that is commonly supplied with saxophones. 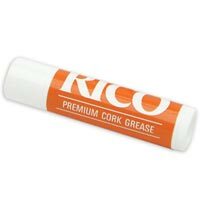 cork grease makes affixing your mouthpiece to the crook a breeze. Regularly applying a small amount of cork grease to the cork at the end of the crook when it's stiff putting on the mouthpiece will help ease the process of assembling your instrument which will reduce the chance of bending keywork out of alignment. It is always a good idea to clean off any old grease and grime with kitchen roll before reapplying more grease. A saxophone stand is a worthwhile investment for new players. Many instrument breakages and damage arise when instruments are knocked off chairs, beds etc when not in use. A good stand will help avoid these situations. Some lower profile stands conveniently fold up and store in your saxophone bell, making transport easier. A sling can be helpful in taking the weight of the instrument off of the player. Slings tend to be more popular, however harnesses offer the best support as they avoid pressure on the neck. When buying a support, pay special attention to the quality and construction of the hook. As these hold the weight of your instrument they are particularly important. An ideal starter instrument, The JP041 is free blowing and capable of playing all musical styles from Classical to Jazz with a full mellow sound. This student model is a favourite with beginners and first time players alike. 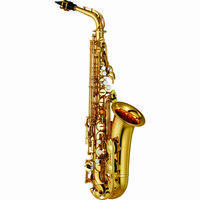 If you are a beginner on the Saxophone or even an established player looking to source one, then the John Packer JP045 Eb Alto Saxophone is an ideal and affordable option. For a beginner the JP045 is a good introduction to the Saxophone and is capable of taking you through to the middle grades. Relatively light-weight and ergonomically shaped, the YAS-280 has been designed specifically for the beginner and is easy to hold and play. The intonation is great, and is easy to get a clean and focused sound. 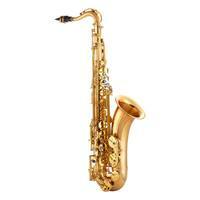 This Jupiter alto saxophone would be a good starter instrument. It is a gold lacquered instrument which features a high F# key and articulated G# key with tilting Bb rocker arm. The saxophone comes in a fabric covered hard case with rucksack and shoulder straps and with a student mouthpiece, sling, sample reed and a Jupiter cleaning kit. Please note this saxophone used to be the Jupiter 565. A revolutionary Alphasax by Trevor James... A full sized Eb alto saxophone designed for small hands so that younger players can now start 2 - 3 years earlier and weighing 33% less than most conventional models. An incredible 46% lighter in its special lightweight hard case. The Yamaha YTS-280 Bb tenor saxophone offers you the perfect start or upgrade because it is designed with the beginner in mind. It can complete the grades with ease and is a very reliable, and affordable, choice for doublers looking for good quality on a budget. Several schemes are in place to support new players as they start their journey to learn the clarinet. Our instrument hire scheme enables students to hire a clarinet at an affordable monthly cost with a low minimum hire period of just 3 months. Should you then wish to purchase your instrument, our hire scheme allows a maximum of 6 months hire charges to be deducted from the overall cost. This is a fantastic way to get started on a limited budget! Our Assisted Instrument Purchase Scheme (AIPS) aims to reduce the financial burden of purchasing your first instrument. If students are attending a UK based state school it is usually possible to purchase the instrument through the school benefiting from their VAT exempt status. Students must be in full time education and receiving music tuition. It is possible to combine both our instrument hire scheme and then to purchase the instrument through the school via the AIPS scheme for maximum benefit. Andy, our woodwind manager is more than happy to answer any saxophone related queries that you might have, feel free to contact him via our contact form or comment below.